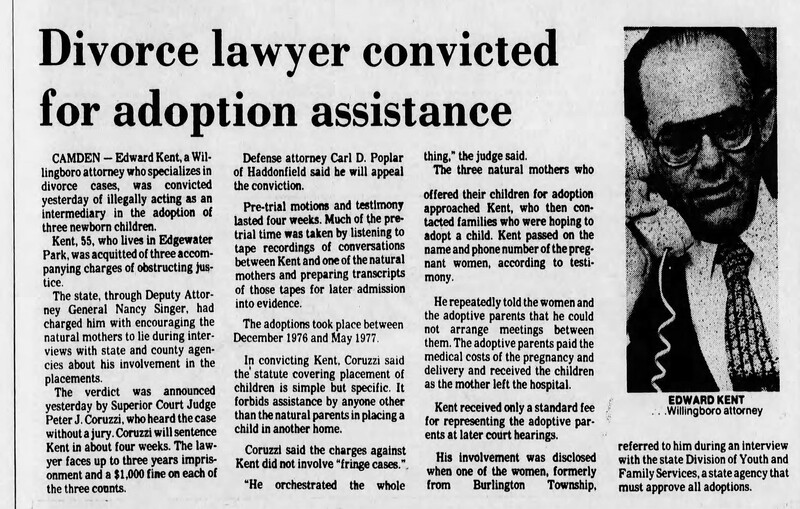 Below are some of the newspaper articles about the 1978 indictment against Edward Kent–the attorney who illegally arranged Michelle’s adoption and a few others. New articles will be added over time. In some of these articles, Michelle is the child referred to as the December 4, 1976 “incident” (the day she was handed to her adoptive parents.) Some of these articles include statements taken from Kent’s court testimony that completely contradict Hollie’s experiences, including his heavy involvement after Michelle’s birth. They also contradict much of the information Michelle’s adoptive father provided to her in 2017. A separate post will be made at a later date about these serious issues, and the major inconsistencies in what Edward Kent stated in court and what actually took place. SOURCE: Winkler, Renee. “Lawyer indicted as a middleman for adoptions.” Courier-Post [Cherry Hill, NJ] April 14, 1978: Page 5. Print. SOURCE: Lordan, Francis M. “Lawyer accused in 3 adoptions..” The Philadelphia Inquirer. April 15, 1978: Page 1B. Print. SOURCE: UPI, 15 April 1978 – The New York Times: Page 24. Print. SOURCE: Winkler, Renee. “Appeal of lawyer is rejected.” Courier-Post [Cherry Hill, NJ] November 18, 1978: Page 39. Print. SOURCE: “Memory fails witness in adoption case.” Courier-Post [Cherry Hill, NJ] June 5, 1981: Page 4B. Print. SOURCE: “Divorce lawyer convicted for adoption assistance.” Courier-Post [Cherry Hill, NJ] June 25, 1981: Page 5E. Print. SOURCE: Winkler, Renee. “Adoption lawyer’s term suspended.” Courier-Post [Cherry Hill, NJ] October 17, 1981: Page 3B. Print. Case 1980 – Edward Kent [view judgement] 1 July 1980, Superior Court of New Jersey, Appellate Division.